Greetings, Stampers! I could not possibly be any more happy or excited than I am today! I am thrilled to announce that I have been invited to be part of the permanent design team at The Paper Players! I am so honored to craft alongside such super talented ladies and I'm really looking forward to the weeks and months ahead. 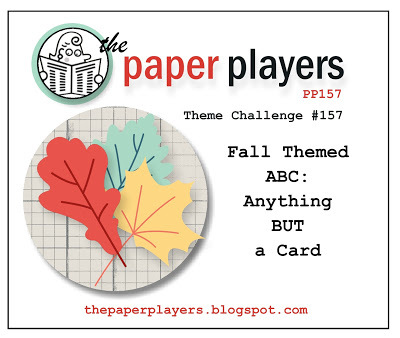 Ann Marie is hosting this week's challenge, which is "ABC: Anything But a Card" with a fall theme. I had lots of ideas, but ultimately decided that I would start working with my Thankful Tablescape Kit. I hope you are inspired by what I came up with! 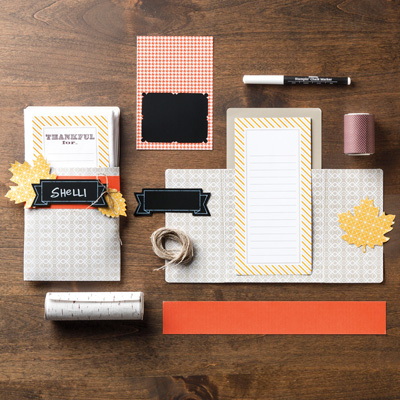 The Thankful Tablescape Kit is a product from the Stampin' Up Holiday catalog that includes sufficient materials to create a table setting for 10 guests including napkin holders, place cards and more. I used the part of the kit designated for a centerpiece today. 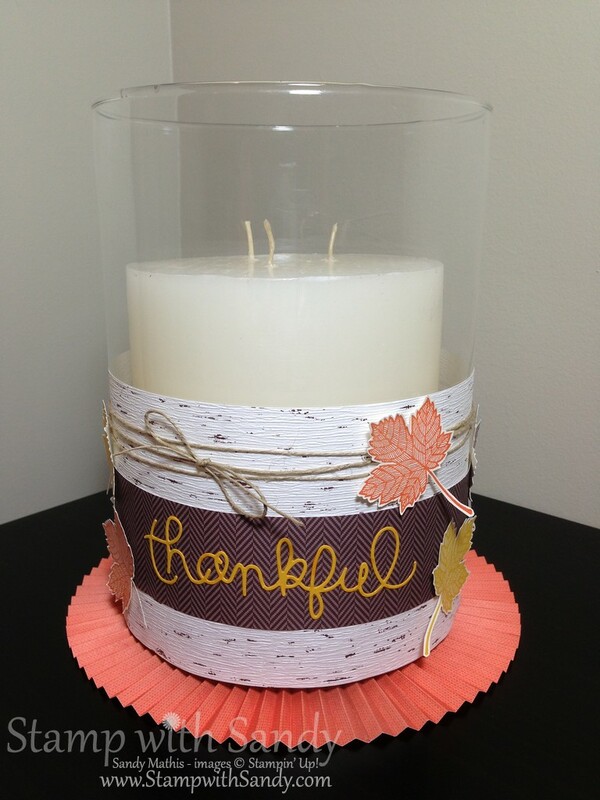 The base is Birch Paper Ribbon, and I wrapped it around a large candle jar, 7" in diameter. When I tell you there is lots of this beautiful paper left over, there is plenty to do three more candles this size. Beneath the candle jar, I created a rosette from Sweater Weather DSP, which coordinates with the kit. The sentiment was perfect for my project, and was made with the new Expressions Thinlits Dies. The leaves were stamped with the Magnificent Maple Stamp and cut out by hand. In the weeks ahead you will see more projects made with this kit. I love Thanksgiving and can't wait to to finish my tablescape! I'm already craving some pumpkin pie! Thanks for visiting and be sure to see all the other awesome projects by the design team at The Paper Players! Sandy - what a classically beautiful centerpiece of the Thanksgiving table. Congratulations on being a member of The Paper Players! Woo hoo! Simple and elegant. I'll be looking forward to more of your challenge projects on The Paper Players! This is gorgeous Sandy and congrats on joining the Paper Players!!! A beautiful candle, Sandy! Don't you just love this kit! Your project and write-up are as beautiful as always, really wonderful! What wonderful news too, DT member; congratulations and have a wonderful time! We can't wait to see more of your beautiful inspirations! Have fun! Congratulations, Sandy! They (and we) are so lucky to have you as part of the DT!! Your candle art is sensational!! This is wonderful! Another great idea....I don't host Thanksgiving dinner so when I received this kit, I wasn't quite sure what to do with it...in fact, it is still unopened! NOW I have some ideas! Sandy, firstly, we are so thrilled to have you along as a permanent member of our design team! What a great project to kick off your time with us! I think this is a fabulous use of the kit. I'd pretty much ignored this is the catty and think I need to go take another look at it.